Okay, so it's magnets and not paper like the dress-up-dolls of your childhood, but now you can stick your very own Hero of Canton on the fridge - and dress him as you see fit! It's a shame Jayne's the only member of the Serenity's crew that you can get (so far) in this form - pants-only versions for all! - but it'll have to do. If you're interested, you can pick up Jayne on Think Geek for $8. 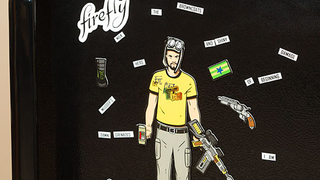 A fun little Christmas gift for the browncoats in your life!